SOHO's record-breaking discovery was made late on 25 June. When it comes to comet catching, the SOlar and Heliospheric Observatory has one big advantage over everybody else: its location. Situated between the Sun and Earth, it has a privileged view of a region of space that can rarely be seen from Earth. From the surface, we can see regions close to the Sun clearly only during an eclipse. Roughly 85% of SOHO discoveries are fragments from a once-great comet that split apart in a death plunge around the Sun, probably many centuries ago. The fragments are known as the Kreutz group and now pass within 1.5 million km of the Sun's surface when they return from deep space. At this proximity, which is a near miss in celestial terms, most of the fragments are finally destroyed, evaporated by the Sun's fearsome radiation – within sight of SOHO's electronic eyes. 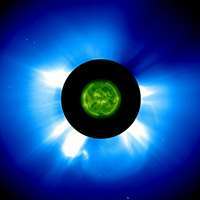 The images are captured by the Large Angle and Spectrometric Coronograph (LASCO), one of 12 instruments on board. Enthusiasts from all over the world look at each individual image for a tiny moving speck that could be a comet. When someone believes they have found one, they submit their results to Karl Battams at the Naval Research Laboratory, Washington DC, who checks all of SOHO's findings before submitting them to the Minor Planet Center, where the comet is catalogued and its orbit calculated. The wealth of comet information has value beyond mere classification. "This is allowing us to see how comets die," says Battams. When a comet constantly circles the Sun, it loses a little more ice each time, until it eventually falls to pieces, leaving a long trail of fragments. Thanks to SOHO, astronomers now have a plethora of images showing this process. "It's a unique data set and could not have been achieved in any other way," says Battams. All this is on top of the extraordinary revelations that SOHO has provided over the 13 years it has been in space, observing the Sun and the near-Sun environment. "Catching the enormous total of comets has been an unplanned bonus," says Bernhard Fleck, ESA SOHO Project Scientist. Did a comet hit cause an explosion on the sun?